You may not think to be on the lookout for black mold in your refrigerator, but the steady moisture, cool temperature, and persistent darkness can make the inside of your fridge the perfect breeding ground for black mold. If you find black mold in your refrigerator, you must figure out the cause, get rid of the mold, and take steps to prevent the mold from coming back. This article will help you with each of these steps. Any type of mold in your refrigerator is a problem. It’s not usually necessary to precisely identify what kind of mold it is – if you see mold, you need to get rid of it. But when you think about “black mold” you often mean the mold whose scientific name is stachybotrys chartarum. This mold produces mycotoxins, toxic compounds that can cause serious health issues if you come into contact with them by either touching or inhaling them through the air. 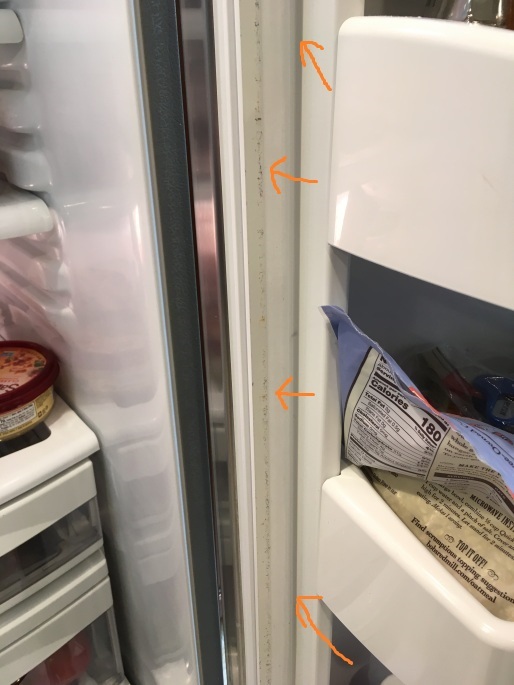 Regardless of whether the mold in your refrigerator is stachybotrys chartarum or another kind of mold, it may cause health problems for you and your family members. Many kinds of mold have allergenic properties, meaning they can cause sinus congestion, coughing, asthma symptoms, irritated eyes, rashes and more. These problems can become severe and even deadly for people with compromised immune systems, the elderly, and very young children. All mold types, especially black mold, are a risk to your health and should be removed as soon as possible. Why is There Black Mold in the Refrigerator? Mold spreads through the air and through surface contact. The number one source of refrigerator mold is mold on food. Some types of food, such as cheese and hard salami, produce mold naturally and can still be eaten once the mold is cut away. These kinds of molds are less likely to spread to other foods and surfaces. But rotting foods, including most produce, grains and nuts, will develop mold growth that not only destroys the food, but is dangerous to consume. These molds may spread to the refrigerator through the circulation of cold air, and by sitting in a drawer or on a shelf long enough for the spores to transfer to the plastic or metal surface. The refrigerator is dark much of the day, which allows mold to grow quickly, but you may not see it until it has become a larger issue. 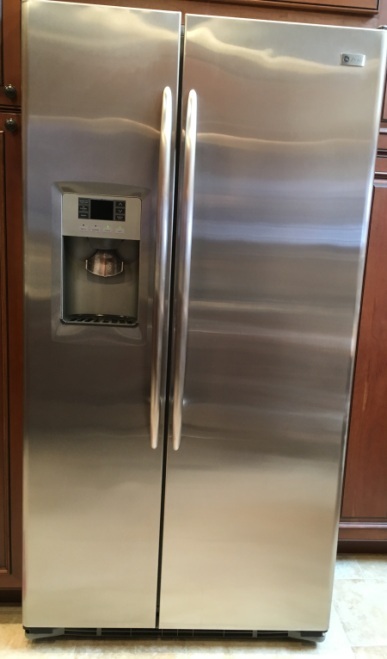 If the mold is being caused by something other than food rot, or returns even after you have cleaned the fridge thoroughly, you may need to have your refrigerator repaired. Perhaps the humidity level is too high due to mechanical malfunction. A leak in the water line can also encourage the growth of mold. A repairman can examine your appliance to make sure it is working properly, and perform any necessary fixes. The first thing to do if you discover mold in your refrigerator is to remove any obviously rotting foods and uncovered foods like leftovers that could be harboring mold spores. Throw this food away. Now, remove the remaining food, beverages and condiments from your fridge and put them in a cooler while you clean. 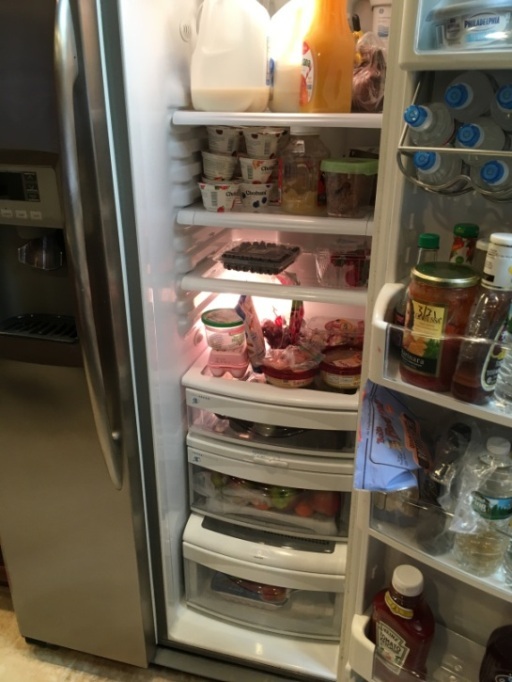 Remove the shelves and drawers if possible to have better access to clean the walls and back of the fridge. To properly kill the mold, you need a cleaner that disinfects and has the ability to kill mold. Not all products will. An excellent all around mold killer and disinfectant is RMR-141. You can also try a diluted bleach solution (one cup of bleach added to one gallon of water). Spray the disinfectant or bleach/water mixture on the refrigerator surfaces and allow it to sit for a minute or two. Scrub it with a rag, and then wipe again with a clean damp cloth. Finally, dry the surface with a clean dry cloth or paper towel. Repeat if needed. Repeat this process to clean the drawers and shelves, then you can return them to the refrigerator. If there is mold on the rubber seal of the door, you can try cleaning it the same way, but the mold will grow back if it has penetrated the surface and grown into the rubber. If that happens you will need to replace the rubber. Whenever you’re cleaning with strong chemicals or bleach, wear gloves to protect your skin. If you are sensitive to mold or have allergies or asthma, you may want to wear a mask as well. If you suspect mold is growing in part of your refrigerator that you can’t access, such as inside the door, in the motor, or within the water dispenser, you won’t be able to get rid of the mold. You will need to replace your refrigerator. Make sure you know why the mold developed in the first place so that it doesn’t start growing in your new appliance as well. The most effective way to deal with black mold in the refrigerator is to prevent it to begin with. Keep an eye on mold-prone foods like fruits and vegetables, and discard food that has started to rot immediately. Always cover foods in the refrigerator with plastic wrap, foil, or other food-safe covering. This will prevent mold spores that begin to grow on your food from becoming airborne and settling elsewhere in the fridge. Make it a regular practice to clean your refrigerator thoroughly at least once a month. Remove all foods and wipe down surfaces with a gentle household cleaner or bleach solution. Check jarred and bottled foods for signs of mold and get rid of items that are no longer fresh or edible. Mold should always be removed right away to prevent further damage to your home. If you think you may have mold growth in areas of your home beyond the refrigerator, you can contact a mold remediation professional in your area for assistance. They will come to your home and give you a free inspection and estimate for removal, if mold is found.